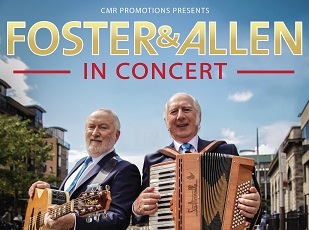 The story of Foster & Allen began back in the seventies when Mick & Tony were playing in Country Music bands around Ireland. In 1975, they got together a small group and went over to the UK to work the Irish music venues on a short tour. Mick & Tony had, at this stage, the idea of working together as a duo, playing ‘easy listening’ music with a touch of traditional Irish instrumentals. When their UK tour finished they decided to let the band return to Ireland whilst they stayed behind to try out the ‘duo’ on the public. They played several venues in the London area and the reaction was very favourable; so much so, they decided to remain as a duo and Foster & Allen was formed. Join Mick & Tony for an unforgettable night of classics.